How to be a TV presenter? There are many of us who wish we could actually work on television and appear as a weather forecaster, children’s TV presenter, news anchorman, or a TV presenter for science shows, game shows, history specials, or sports broadcasts. TV presenting jobs promise a life full of name, fame, and fortune. If your dream is to be a tv presenter then you must start with a proper training. All across the UK there are several colleges that offer basic training courses for aspiring actors who want to be a tv presenter. 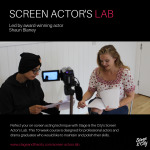 These courses are designed to offer specialised training to aspiring actors on tv presenting jobs. You will be taught the right communication skills, body language, and tips to improve your personality for making a striking appearance on TV. TV presenters make a connection between the audience and the show. Therefore they must have the charismatic draw to attract the viewers to the show. There are several other potential routes to start a career in tv presenting. One of it is journalism. A lot of news anchors start their career as newspaper journalists or as radio reporters. A degree in English is also a good starting point for getting presenting jobs in TV newsroom or on radio. This is because having great command over English is the pre-requisite for tv presenting jobs. You must be able to speak flawlessly and impressively so as to hold back the tv viewers to your show. You can also be a tv presenter if you have some experience of working in a drama college or have done some acting work before. At times, even camera men and sound technicians end up becoming tv presenters by a mere accident. However, it is advisable to have speciality knowledge. TV presenters with a massive amount of specialist knowledge are in great demand by tv production houses since they are experts in their field and can therefore attract avid viewers efficiently to their tv show. If you desperately want to be a tv presenter, it is better to decide your speciality field first. Since there are so many outlets and venues for tv hosting, you must narrow down the area that you would like to work in and then acquire specialist knowledge about it. To be a tv presenter, it is equally important to improve your market visibility. Create your market presence by posting your resume everywhere and by making contacts with acting agents and casting agencies.